Taking the hassle out of everyday laundry tasks, LG washing machines combine stellar cleaning power, eco-friendly energy ratings, and a range of innovative features to make washing easier. Our LG washing machine range boasts energy ratings of A+++ across the board, so you’ll save money and energy every time you wash. With a range of colours to choose from – classic white, steel, silver and black – it’s easy to find a machine to compliment your home. 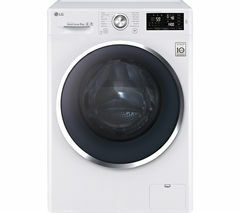 From 7kg up to a high-capacity 12kg, LG’s load sizes are designed to suit a range of needs, with larger load capabilities allowing you to cut down on the number of cycles you need to run. Cut energy and water use even further with innovative features like the LG FH4U2VCN4 Washing Machine’s TurboWash function. Using jet sprays to rinse clothes faster, you’ll reduce energy consumption by up to 15%, water consumption by up to 40%, and a regular cycle is done in just 59 minutes. LG washing machines feature doors than open through 350° for easier loading, 6-drum roll technology for better cleaning, and Quick Wash programmes that take just 15 minutes too. Making fantastic washing faster, greener, and more affordable, with an LG washing machine you’re sure to find the right cycle for your family. 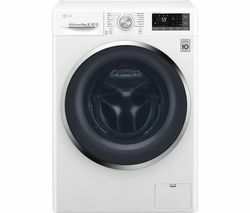 View more great LG appliances such as tumble dryers to keep your clothes clean and dry.